All new electronic distributor for the flathead V8. 12v negative earth, Manufactured in England by Stromberg. IMPORTANT! Electronic modules DO NOT like bad grounding. Make sure the engine has a good earth cable. 6v positive earth, Manufactured in England by Stromberg. 1942-48 Flathead V8 Distributor Cap, Crab Type. Also fits Stromberg E-Fire electronic distributor. (Not for Ford V8 Pilot with Lucas distributor). This 12v negative earth electronic ignition kit fits the 1942-48 Ford Flathead V8 with the front mounted crab style American distributor and provides increased voltage for improved performance and fuel efficiency. The system uses the Pertronix Ignitor module which fits neatly underneath the distributor cap and is compatible with all 12 volt negative ground systems. Note: We recommend our 1.5 ohm performance coil and plug leads, for maximum performance, with electronic ignition. IMPORTANT! Electronic modules DO NOT like bad earthing on the engine. We suggest you add a good earth cable from the chassis to the bellhousing. This 6v positive earth electronic ignition kit fits the 1942-48 Ford Flathead V8 with the front mounted crab style American distributor and provides increased voltage for improved performance and fuel efficiency. The system uses the Pertronix Ignitor module which fits neatly underneath the distributor cap and is compatible with all 6volt positive ground systems. 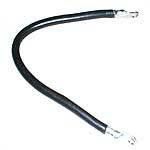 Note: We recommend our 0.6 ohm performance coil and plug leads, for maximum performance, with electronic ignition. This electronic ignition kit fits most 1949-1953 Ford Flathead 8BA V8 and provides increased voltage for improved performance and fuel efficiency.